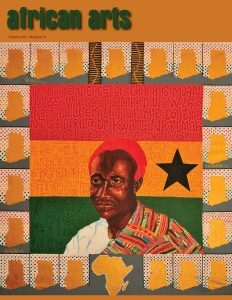 African Arts, the quarterly journal published by the UCLA James S. Coleman African Studies Center, is partnering with the University of Florida and the University of North Carolina at Chapel Hill to create a consortium that will share editorial oversight and financial support for the journal, beginning with Volume 49 (2016). African Arts is particularly excited to include editorial representation from the African continent, which will commence with Volume 50 in 2017, when Rhodes University of South Africa becomes the fourth partner. Steven Nelson, Director of JSCASC, observes that “The consortium is an exciting proposition that will bring new editorial viewpoints to African Arts and ensure its continued existence as the leading journal in its field.” Consortium publishing is a new way to share the duties of high-quality academic publishing in an era of decreasing academic financial resources and increasing administrative demands upon educators’ time. First instituted by TDR: The Drama Review under Richard Schechner at NYU in 2010, consortium editing allows for a variety of editorial viewpoints within a single journal. At the same time, the consortium structure spreads the financial responsibilities of producing a high-quality illustrated publication across multiple institutions while maintaining the efficiency of a centralized management and production office. University of North Carolina-Chapel Hill—Carol Magee, David G. Pier, and Victoria L. Rovine, along with Lisa Homann at UNC-Charlotte. Ruth Simbao of Rhodes University in South Africa will join the editorial consortium in 2017. The coordinating editorial and production office will remain at UCLA under the direction of Executive Editor Leslie Ellen Jones and Operations Manager Eva Howard. Consortium institutions will contribute to production and staffing costs of the journal. In addition to UCLA’s established support, funding will be provided by the University of Florida Office of the Provost; University of North Carolina-Chapel Hill’s Department of Art, Department of African, African-American and Diaspora Studies, African Studies Center, Center for Global Initiatives, College of Arts and Sciences’ Dean’s Office, Global Education Fund, and Institute for the Arts and the Humanities; and, as of 2017, Rhodes University, and other colleagues in Africa. Each team will be responsible for the feature articles and “First Word” opinion column for one issue per year, while departmental and reviews columns will continue to be the responsibility of editors appointed by the consortium as a whole. Consortium members will review independently submitted articles as well as oversee themed issues proposed to the board by outside guest editors. Independent papers may be submitted through the journal’s online system. Proposals (with abstracts and sample images) for guest-edited theme issues should be submitted to the Executive Editor at afriartsedit@international.ucla.edu. More information about African Arts and links to author guidelines can be found at its website. African Arts was founded at UCLA in 1967 as “a quarterly magazine devoted to the graphic, plastic, performing, and literary arts of Africa, traditional and contemporary,” with an intended audience of academics, art collectors, and general interest readers. Over the decades, it has evolved into an academic journal focused on the visual cultures of Africa, featuring abundant full-color illustration and cutting-edge scholarship. It is the oldest continuously publishing journal in the field of African art history and the only one to encompass both traditional and contemporary African art genres in media ranging from wood to WiFi. MIT Press Journals distributes the journal print, electronic, and ebook formats; it is also archived on JSTOR and, as of Volume 49, no. 1, available through Project Muse.